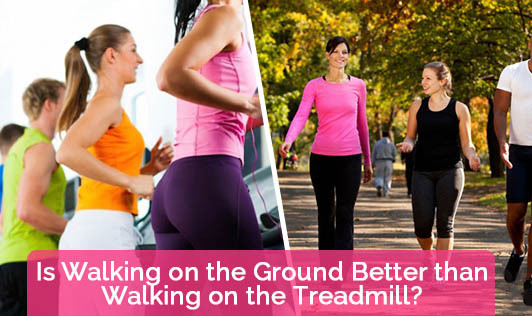 Is Walking on the Ground Better than Walking on the Treadmill? A gymnasium isn't complete without the treadmills. Some people use it at home for exercising now-a-days. Have you ever felt a difference between walking on a treadmill and walking on the ground? Which one works better for you? A treadmill is one of the easiest cardio equipments one can adapt to, as walking is something that everbody can take to, irrespective of fitness levels. The treadmill is also used for running and interval training. One of the main advantages of a treadmill is that it has a predictable even surface which is easy to walk / run on, compared to the road or a trail. Another great advantage is that the user can control speed, incline, warm up & cool down period, etc. Many users prefer watching television or reading while using the treadmill to make the exercise interesting. However, the treadmill's primary disadvantage is that it moves you in a different way than regular running. On a treadmill, as your left foot lands, the treadmill drags it behind, and you land the right foot before the left foot gets dragged too far back. Hence constantly, you are cushioning the impact with your kness, without needing to pull the leg back. This develops imbalances in your running style and muscular developments which in turn increases the risk of injury. Besides, it is common knowledge that moving on a moving surface is far easier than using your muscles and body weight to create the mumentum. In conclusion, while a tread mill is easy to workout on and can be used indoors, the efficiency and calorie burn is not as high as jogging / walking outdoors. So, whenever you have the opportunity to walk, jog or run outdoors, use it!